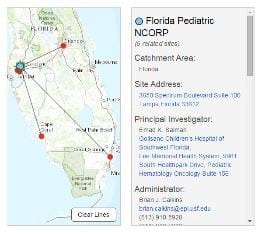 This interactive map application shows location and contact information of NCORP Research Bases, Community Sites, Minority Sites, Component Sites, and Subcomponent Sites in the United States. Click a Site Marker on the map to display additional information about these sites. Selecting a Community or Minority Site will also display the associated Components and Subcomponents and draw lines connecting them. Selections can also be made by choosing a state in the dropdown menu. This will show all Components and Subcomponents within a state, and draw relationship lines to the corresponding Community or Minority Site. Zoom to State Zoom to State Zoom to Entire U.S.
Click on NCORP sites in the map to show details in this area.